Okanagan Falls, Okanagan Valley, British Columbia, CanadaEarly 2016 looked a lot like 2015 with warm, dry conditions, early bud burst, and a warm advanced harvest, but cool and wet weather brought all that to a halt in July, extending the season back into a more normal and acceptable time frame for pinot noir maturation. A cooler harvest saw very little shrivel on the younger berries. Early September showers retreated, leaving a perfect fall finish. The harvest commenced on September 21 and ran through Oct 5. They picked the pinot at 24 to 25.5 brix and it’s all off the home McLean Creek Road Vineyard in Okanagan Falls, a mix of French Dijon and Pommard clones set out in three separate, steep-sloped, organically farmed blocks facing south, west and northwest. The attack is cherry, raspberries and plums with soft, silky, melt in your mouth tannins and a twist of forest floor, all at an exciting 13.5 alcohol. Delicious drinking already and full measure for an eleven month stay in all French oak (only 25 per cent new). If you are patient you could cellar this for three to five years. Pork belly is a decadent match.Tasted: 07 March 2018Tasted by: Anthony GismondiTreve Ring Prices: BC	40.00	winery direct Producer: Meyer Family VineyardsDistributors: International Cellars Inc.
Okanagan Falls, Okanagan Valley, British Columbia, CanadaMeyer Family Vineyards have carved a spot for themselves with their single vineyard pinot noirs and chardonnays. This is from their Okanagan Falls estate McLean Creek Road Vineyard, with its sloping alluvial and glacial gravels and sandy loams. Five Pommard and Dijon clones (114, 115, 91, 667, 777) were farmed organically, plot by plot. All was destemmed (15 percent whole cluster) to a cold soak before a native ferment. Post maceration, this was transferred to French oak, a quarter of which was new, for 11 months. 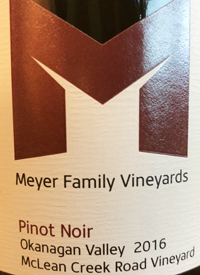 Though this is a generous, softer, ripe wine, there's a tense vibrato of acidity that streams throughout, cutting through the forest berry, cherry leather, ripe fruit, wet forest, and toasty wood, and keeps this streamline. A sweet sarsaparilla note floats right to the snappy finish, lingering with warming, smoked baking spices. Another classic MFV wine, drinking well now, but will reward with short-term cellaring. 650 casesTasted: 07 March 2018Tasted by: Anthony GismondiTreve Ring Prices: BC	40.00	winery direct Producer: Meyer Family VineyardsDistributors: International Cellars Inc.